Whether it is showing customers how construction sites are progressing in India, helping utility companies spot faults in distribution lines across the United States, or assisting with stock take at warehouse operations in South Africa, drones have changed the way business works. So, what began with aspirations of home pizza deliveries has grown into an industry that can add value to just about any sector of the market. Given how rapidly the technology has evolved, drones are sophisticated tools that can capture data accurately (think HD cameras, GPS locations and other embedded sensors), can access high-risk areas without compromising the safety of employees, and are secured using sophisticated algorithms. Just consider trying to inspect the safety of a 60-floor skyscraper. In the past, this was a labour-intensive task often involving hiring an expensive helicopter. Today, this has largely been taken over by drones that can capture inspection information and measurements, as well as take marketing photographs. It is estimated that there will be 600 000 drones operating commercially in the US by the end of this year. This reflects how pervasive these devices have become and the opportunities they provide business. As mentioned, these units have become invaluable for inventory management and stock take. Even better, it can take place without requiring a business to shut down, as it is not as pervasive an activity as getting employees to manage the stock take process themselves. So, whether it is stock taking, surveying, photography, security, emergency services, or any other application, drones do offer several use case scenarios. One of the most significant advantages the technology provides is the ability to transmit data in real-time. While much has been written about the pervasiveness of the Internet of Things (IoT), thoughts generally turn to land-based devices. However, the appeal of drones should not be neglected as it can provide a significantly different perspective as opposed to land-locked systems. All this data being generated can feed directly into an integrated enterprise resource planning (ERP) system. On its own, the drone data is useful, but the real power of these devices lies in unlocking insights through the ERP of the business. With data being generated on a real-time basis, the business can also respond faster than before, thanks to the powerful analytical solutions at their disposal. Consider the impact this real-time response could have on security, for example. Being able to monitor securely from above, armed response companies can send additional support to crime zones as required. They are also able to view hotspots – for more accurate risk assessments – before dispatching units. From a manufacturing industry perspective, we have touched on the positive impact on stock take. 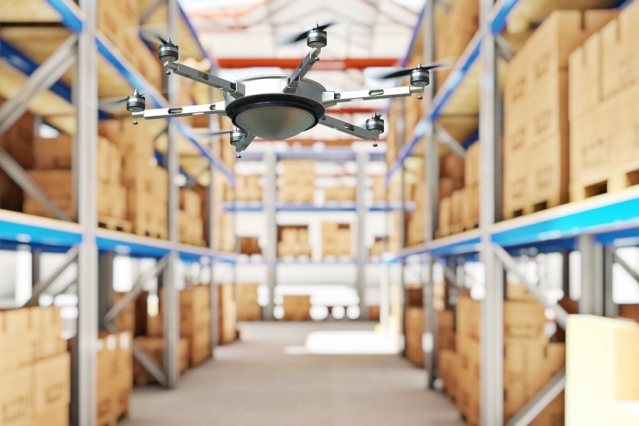 Building from here when it comes to inventory management, drones (when linked to ERP) empower decision-makers with insights necessary to meet customer needs more organically than previously. Drones should therefore be viewed as an invaluable business tool especially when integrated with more dynamic ERP solutions. They provide decision-makers with an invaluable solution to deliver on customer expectations faster than before and help influence strategy in ways previously unimaginable. One day, drone pizza delivery will be ubiquitous, but there are already so many more things to be done with the technology.